The Four Roses distillery is a great one to experience. The buildings have a Spanish Mission feel to them and are unlike any other distillery devoted to bourbon and its heritage. Four Roses barrel houses are very unique as well. There are not the typical eight (8) story barrel houses. There are only one (1) story tall; where six barrels can be stacked one on top of one another. All of Four Roses bourbon that is aged within them will have similar aging temperatures. This helps create a more consistent and mellow bourbon throughout the warehouse. 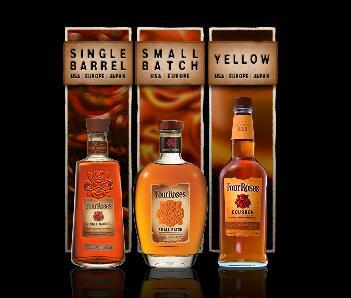 Four Roses is the only bourbon maker that makes ten (10) different types of bourbon to make on three (3) different expressions. They are created from two different Mash-Bills and five (5) different Yeast Strains. The bourbon that is created has a range from very floral and fruity nose and palate; to a high rye content bourbon that is full flavored, rich and a slight bit spicy. Their current American distributed products include a Yellow Label staple expression (created from all ten (10) bourbons mingled together), a Small Batch (created from only four (4) out of ten (10) expressions)and a Single Barrel (created from the OBSK bourbon; This bourbon is the highest rye content bourbon that is full flavored, rich and a slight bit spicy). They also have a number of Special Editions of each expression that come out from time to time. A note about their distillery tour: They are one of the only tours that offer a limited edition rocks glass (with the Four Roses log etched into the bottom of the glass) that can only be purchased if you have taken the tour. You cannot purchase the glass in the gift store or anywhere else for that matter (Although, they have been known to show up in the Single Barrel gift sets from time to time; just keep an eye out). Four Roses has a long lasting tradition of crafting fine bourbons. They have the distinct honor of producing ten different bourbons which, they then decide to either marry together, select small batches from and/or hand select single barrels that are simply extraordinary. This is one such single barrel. This is the type of bourbon expression that I truly look for. It is Un-Cut and Non-Chilled filtered. A large amount of bourbon on the market is stripped of its beauty, from chill filtering but, not this one. Four Roses single barrels are made from the highest Rye content bourbons yet, this limited edition if made up of a slightly lower bill. Check out the Four Roses Link above to learn more about the 10 individual bourbons they create. The side of the bottle has a well noted story on how this bourbon came to be. It is presented well with a wooden/cork topper and accented, just below, with a golden Four Roses cravat. The libation is presented well in its clear, non-traditional labeled bottle. All of the lettering is printed directly on. The color has dark amber but, lovely golden blood orange hue. The first nose right out of the bottle is of light corn, vanilla and a hint of oat and spice. A beautiful bouquet of rye, vanilla with hint of char and oat present themselves in the glass. This is truly mouthwatering. Corn and yeast emerges in the middle of the nose with sweet hints of toasted treacle at the finish. This is a perfect description of a beautiful bourbon. Perfectly sweet, with splashes of rye and vanilla. Oily, almost honey like coating which, last in your mouth for some time. Just a pop of intensity that then fades away slowly. The best part of this expression is the finish. Truly lovely. Please take your time drinking this one. Vanilla, oak and little char at the finish while your mouth is nicely warmed. Simply wonderful! This is a beautiful expression that should be enjoyed neat with a drop or two of water. I tend to fill my glass, half-way, with spring water and drink it before I fill my glass with bourbon. This is especially true with Rye expressions. A little bit of water helps to open the spices within. Enjoy this slowly; it is unmatched by its standard shelf brothers. If you happen to have an opportunity to find a bottle, please do not hesitate to pick it up and never let go. Its proof is perfect for the age and oily mouth presence. My words cannot do it enough justice. This limited edition is supple yet, controlled in the mouth. The nose is a classic: oaky-smoky, like you’re standing in the warehouse; there is some confection and vanilla, but the palate tends to dryness. Rye begins with subtlety and then ramps up from the mid-palate into a blooming finish. There will be a new review a few times a year. So, stay tuned in for future reviews. Please write if you have specific bourbon you would like a review on next!